Portland will have affordable housing for artists available at 72 Oak Street, around the corner from the restaurant 555. The anticipated opening date is December 2011. There will be 37 artist-friendly efficiency apartments in total. Avesta worked with architects and designers to make these 37 efficiency apartments artist-friendly. The ground floor includes a gallery and there is a shared workspace on the second floor. The units have high ceilings, deep storage space, and large windows. As an affordable housing solution, the all-inclusive rent is based on income and there is an income limit. Applications are reviewed and processed in the order they are received. Please share the attached information with artists who are looking for affordable housing in the Arts District. For more information and to get added to the inquiry list, visit Avesta Housing. 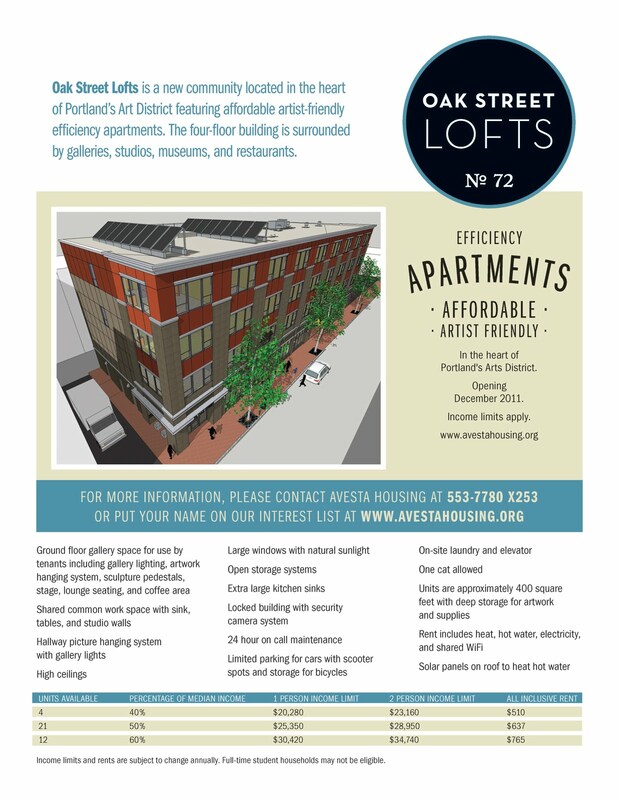 The efficiency apartments for artists thing seems like a good idea on the surface and I am sure makes folks feel good if it is pitched to them properly. A better resource (IMHO) would be artist WORKING spaces on the cheap in a warehouse or building somewhere that could open up on first fridays. Not living space, working space for artists with a resource to show work and move art. There are MANY artists on the outskirts, and intown Portland who have Families, kids, Rents and what not. But need a dedicated space to produce and move their art. This building might be great for a young, single artist with no family who is struggling to hold a job. Lets just call it what it is..... Elitist space reserved solely for MECCA students. Go ahead, beat me up over this comment...I'm just looking at a transparent situation and reading the text behind it. Lloyd I believe you are right. How about both? A place to live and a place to work/sell? If you go to the Avesta website you may notice that it also says "Full Time student households may not be eligible." FYI.